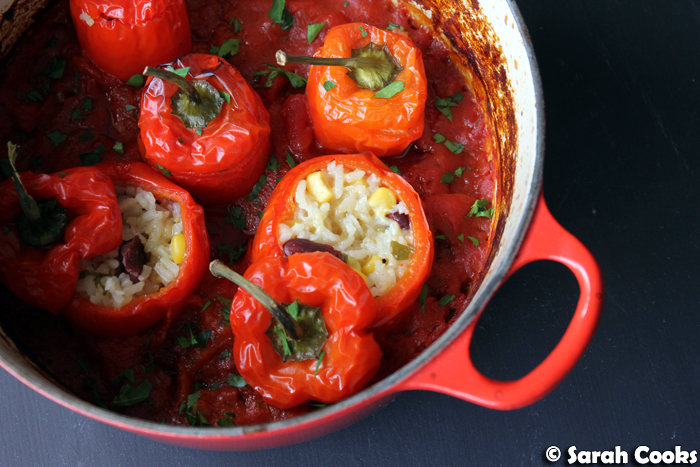 Today's recipe is a light but hearty dish of cute little red capsicums, stuffed with a cheesy-rice and bean mixture, all slowly cooked in a rich tomato sauce. It's full of flavour and full of vegetables, something nice and nutritious to balance out all the Christmas season treats that I undoubtedly will be (and have been) eating. Oh my goodness, we are just barrelling towards the end of the year! Just over three weeks until Christmas! I hope your preparations are all underway! We'll actually be travelling over Christmas, so we've already done our Christmas lunch with the family (plus the bonus Thanksgiving dinner I told you about last time). I absolutely adore festive eating, but it's around this time that I start to crave vegetables even more than usual. This recipe for vegetarian stuffed capsicums was one I created for Prahran Market's A-Team last month, and I think is a perfect wholesome vegetarian meal. In the mystery bag were some lovely organic lemons from Gippsland, a gorgeously fragrant bulb of fennel, a block of smoked mozzarella, and the cutest little capsicums ever! When I saw these, I knew I had to make something that showed off their shape. No way was I going to chop them up! My mother-in-law (now officially in law, woohoo!) in Germany often makes stuffed capsicums. 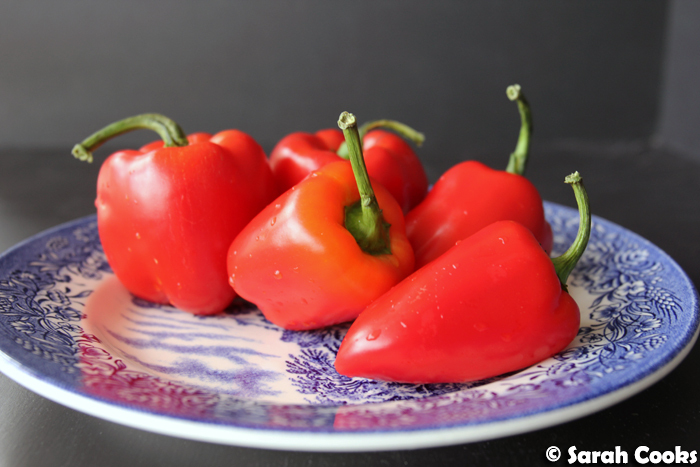 (In a confusing turn of events, the German word for capsicums is "Paprika", and they're usually called "peppers" in the UK and the States). She stuffs them with a seasoned minced meat mixture and slowly cooks them in gravy. The lovely capsicum sweetness infuses the sauce and the meat, and it's really delicious. I wanted to echo her stuffed capsicums, but keep them both vegetarian and vegetable-filled. I stuffed the peppers with a vaguely Tex-mex mix of rice, corn, beans and cheese, with some spring onion and parsley. I spiced the filling with a touch of cayenne and paprika (paprika the spice, not German capsicums...), and lots of salt and pepper. For extra nutritional benefits you could use brown rice or quinoa, but I'm a fan of good old plain white rice. I cooked them in a simple tomato ragu - the type of sauce you'd use for pasta. You know the drill, cook some onion and garlic in olive oil, add tinned tomatoes and herbs, and simmer until thickened. I love this type of sauce, and I cook it all the time. Bonus: vegetables that don't feel vegetable-y, do you catch my drift? So! 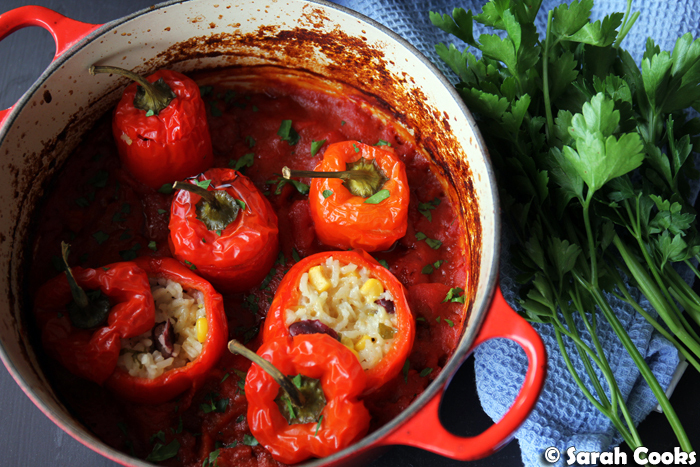 You pop the little stuffed capsicums into the sauce and let them cook slowly in the oven. (Depending on the size of your capsicums you may have leftover rice stuffing - either spoon it around the capsicums into the sauce, or simply serve separately later). The little capsicums will slowly soften in the heat of the oven, losing that intense freshness and cooking down into mellow sweetness. I really enjoyed this meal - it's approachable, healthy, comforting, and delicious - everything you want! Serve as it is or with a crisp green salad on the side. Wash the mini capsicums, slice the lid off (but don't discard!) Pull out the seeds and membranes and discard. If the capsicums don't sit upright, slice a bit off the bottom to give it a flat base. To make the sauce, heat the olive oil over a medium heat in a pan with a lid that can go from stove to oven (like a dutch oven, heh). Finely chop the onion and cook for 5 minutes or until softened. Add the garlic and cook for a minute or two. 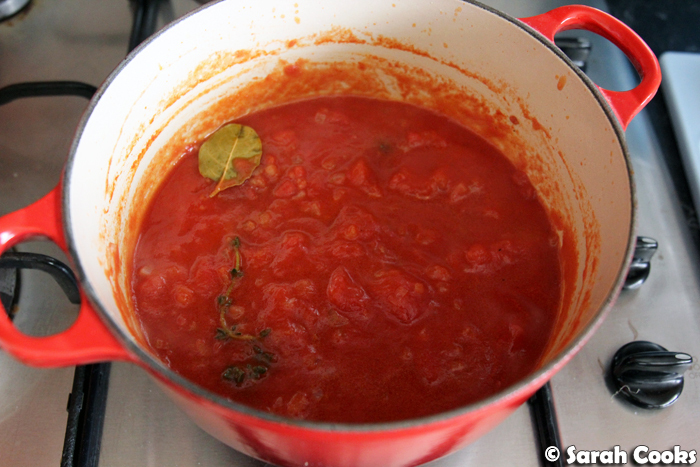 Add the crushed tomatoes, half-fill the empty tin with water, swill it around and add it to the pot. Add the bay leaf and thyme sprigs. Season generously with salt and pepper. Simmer for 5 minutes, turn off the heat and set aside. To make the filling, place the rice and vegetable stock in a small saucepan, bring to the boil, then clamp on a lid, turn the heat down to lowest and cook for 15 minutes. Take off the heat, remove the lid and fluff with a fork. Allow to cool sightly and turn the rice out into a mixing bowl. Chop the spring onion and parsley and add to the rice. 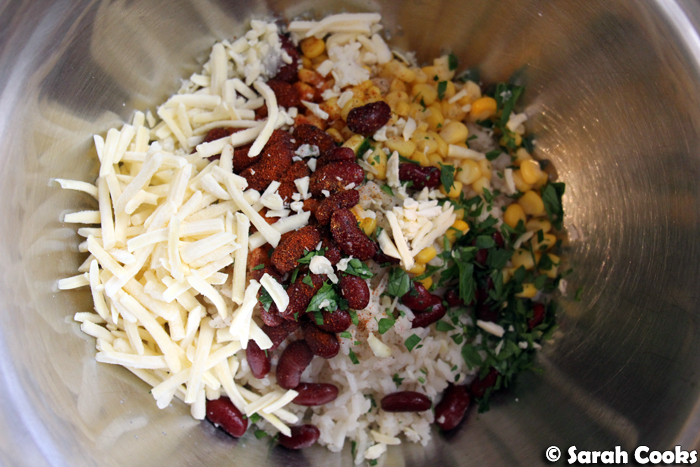 Add the corn, beans, cheese, paprika and cayenne pepper. Season generously with salt and pepper and mix to combine. Spoon the mixture into the capsicums (don't overfill), and arrange the capsicums into the sauce. 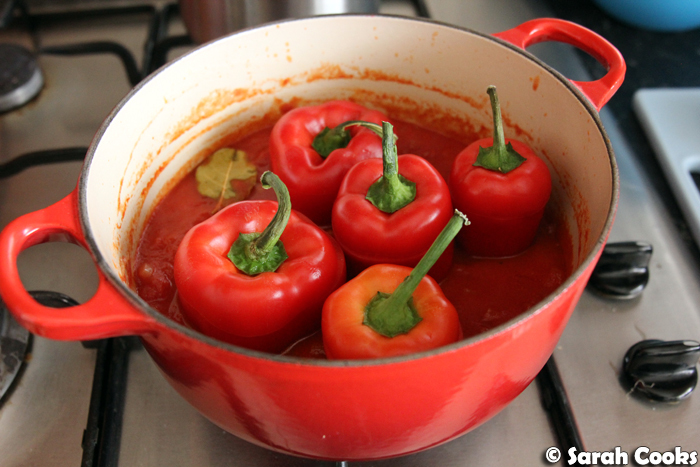 Place the lid on each capsicum, and place the lid on the pot. If you have extra rice mixture you can spoon it around the capsicums into the sauce, or serve separately later. Garnish with extra flat-leaf parsley. Looking delicious by seeing the images its mouthwatering I 'll try this thanks for sharing.